Blue Ribbons are our way of giving a little extra kudos to outstanding home cooks and their recipes. How are Blue Ribbons Awarded? Our very own Test Kitchen reviews and prepares a large sampling of promising recipes. Folks in the Honorary Kitchen Crew test recipes at their leisure in their own home kitchens. 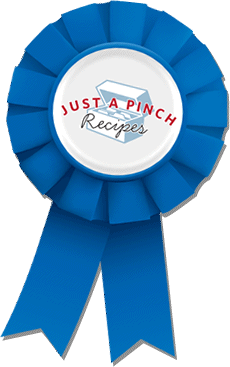 Members of Just A Pinch can nominate their favorite recipes after stamping them Family Tested & Approved. Recipes with 3 or more nominations are elevated to the Test Kitchen for review and testing. Once a year, Premium members can "boost" a recipe for the Test Kitchen to try by using their Blue Ribbon Fast Track. What Happens if My Recipe Wins a Ribbon? Not only will your recipe receive a Blue Ribbon on the website, but we'll also send you a real ribbon in the mail! Love a recipe? Share the love by marking it Family Tested & Approved and even nominating it for a Blue Ribbon! Check out these popular recipes! You may just love them enough to stamp 'em Family Tested & Approved... or even nominate them for a Ribbon! Tried and loved a recipe? Stamp it Family Tested & Approved! How much did a dish make you smile? Choose the smiling star rating that fits your recipe mood!